Brent and Harrow Tories are to select their London Assembly candidate on this Thursday from the three candidates shortlisted earlier. Molly Irene Samuel-Leport MBE, England born east Londoner, is well known for her sports achievements, including 1987 Jamaican Jubliee Award for Excellence. She is impressive orator. Molly Samuel is a member of the Conservative Way Forward advisory board along with Harrow councillor Paul Osborn, leader of the Tory opposition group. She is a six time karate world champion, and was the unsuccessful candidate for Walthamstow at the general elections. She has been active in community matters and is well known for her interest in homelessness and social justice issues. Molly Samuel believes that schools need to change to include self-defence and self-awareness education for young children of primary age. George Currie, the “son of working-class parents” who progressed to have a PhD in political philosophy, has helpfully worked with the Brent’s diverse community. He is chair of Brent Central Conservative Association. Mr Currie’s manifesto is to reduce crime by securing more police officers and working with local communities to introduce ‘safe zones’ across Brent and Harrow. He would work to improve the availability of affordable housing by working with councils and developers to identify suitable sites and remove unnecessary blockages, and improve the local environment by working with local residents and businesses to tackle issues, such as poor air quality and the illegal dumping of waste. Kanwal Toor, self claimed Indian actress associated with luxury jewellery and fashion outlet, seems to have little political profile. Social media research in her case reveals qualifying comments like “I am proud to know Bob Blackman. Bob has done a huge amount work for Kashmiri Dogras” – Kashmir issue is very sensitive and a matter of grave international concern. Brent/Harrow could do well without it. However, she stands a chance where her success could depend on the extent of the support by using certain block votes, the strategy, carried out in Harrow West and brought to Harrow East, that seemingly defeated Cllr Susan Hall at the parliamentary selection in Harrow West and GLA selection for Brent and Harrow. 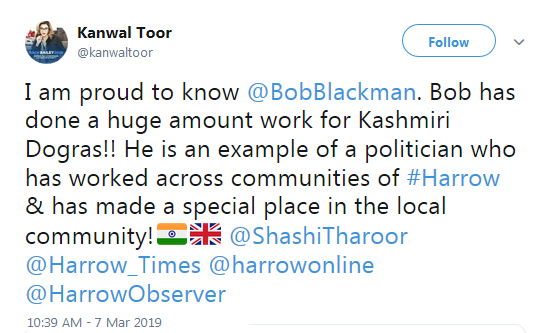 Last time such a Kashmir specific credit was given to the divisive Bob Blackman MP for Harrow East who has been repeatedly exposed for his alleged interactions with far right elements [i] [ii], was by his previous assistant from Kashmir background [i] [ii] who has now left Harrow. This entry was posted in News on March 19, 2019 by admin.